The Tarot of the Holy Light, currently available in an edition of some twelve hundred copies, is a deck designed and published by Christine Payne-Towler and her partner Michael Dowers. She has written extensively on what she terms the "continental tarot"---that is, decks in the tradition of Etteilla, Levi, Papus and Wirth---while he is an underground comic artist, editor and publisher. Stylistically, it pulls together two tendencies which have become increasingly prominent in tarots issued over the last decade or so: it is both a collage deck, as exemplified by the psychogeographical tarots of Paris and Prague---not to mention any number of mash-ups of non- copyright art---and one which draws upon imagery from the great era of alchemical publications, which puts it in the company of Robert Place's Alchemical Tarot, the Alchemical Emblem Tarot of F. J. Campos and Adam McLean, and Le Tarot des Alchimistes of Jean Beauchard. It is tempting to view such decks as evidence of a growing tendency for alchemical iconography to be perceived as a natural visual language for the tarot, as was once the case with the imagery of ancient Egypt. This goes beyond the recognition of both alchemical illustration and the tarot drawing upon a common emblematic stock, just as the various attempts to present the Book of Thoth in its original dress were far more literal minded than a mere acknowledgement that the visual language it employed had sprung from Horapollo. What is perhaps most interesting about this identification of alchemical imagery with the tarot is the evident lack of consensus on quite how these two systems, the interpretation of each of which is contested, should be mapped onto one another. A quick scan of the four decks I have mentioned reveals some interesting overlaps and disparities: the mermaid which one cannot but think of as the Starbucks logo, and which Place indeed identifies with the Star, is the Queen of Cups for the THL; Dowers' Empress is Diana of Ephesus, who also represents Isis (the Papess) in Beauchard's deck, and Strength in Campos and McLean's; Jupiter stands in as the THL King of Swords and Beauchard's Adam (Emperor); while his Priesthood (Pope) is the THL Hermit: this last is the familiar image of Hermes Trismegistus bearing an armillary sphere. While Place and Beauchard redraw and rework figures and details from alchemical illustrations, and Campos and McLean recontextualise the original designs through their placement in the deck, Payne-Towler and Dowers create collages that retain both the beauty and occasional stiffness of their source material, and make no attempt to smooth over the differences in style in their constituent parts. The resulting work is both highly referential and sensuous and, most appropriately, demands to be read as much as looked at. It is also very intensely colored: the Tarot Balbi (which falls in the lineage invoked by Payne-Towler) is the only deck I can think of that delivers such a zing to the eye. The outstanding collage works of the twentieth century were the product of a culture in which some works on paper were zealously preserved and others considered ephemeral: the process of collage subverted the cherished originality of the first, and raised the status of the second to art. This distinction has ceased to apply now that collage has become the manipulation of digitized images: there can be no difference of value between one image file and another, although the ongoing corporate and governmental attempts to enclose digital information raise the possibility of the emergence of a value system based upon daring and the difficulty of access. 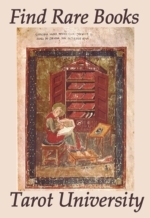 It would be possible to playfully construct an argument that the alchemical books which this deck draws upon were themselves located in a kind of remix culture, rather than one based upon a concept of originality: leaving aside the many images which necessarily recur in slightly differing forms from book to book, many of the engravings from Maier's Atalanta fugiens and Symbola aureae mensae, and Mylius' Philosophia reformata---works which have a significant presence here---were resequenced to accompany fresh texts in the Viridarium chymicum of Daniel Stolcius. Perhaps a good way to give some impression of the deck would be to draw a trump at random. This exercise gives me Strength, marked with its standard Marseille number, 11 (unusually in Arabic rather than Roman numerals) and the astrological sign of Mars. Instead of a mild-looking young woman subduing an unmistakably savage lion, we have the wreathed lion (here a normal tawny specimen, rather than one "green of pelt") from Emblem 37 of Atalanta fugiens, standing solidly in front of the figure which Stanislas Klossowski de Rola identifies as Lady Alchimia, the embodiment of the Volatile Principle, from the frontispiece of Morley and Muykens' Collectanea chymica Leidensia. The background of the card is largely derived from Atalanta fugiens, with the "fetid water" of the original transformed into fresh blue pools and some variety added to the landscape in the form of an outcrop of rock, a church and an extra tree or two. There is no interaction between the two figures, which both face towards the reader. The lion is a herald, or a protector. In this version of the card the woman is, to an eye that does not interrogate the image for symbolism, frankly monstrous, which is not to deny her beauty: the lion, on the other hand, seems to possess both nobility and intelligence. This leads me to wonder quite how our interpretation of these cards should be informed by their models: do a woman and a lion automatically constitute a Strength card, to be read in the same way as it would be in a Marseille deck, or indeed the Rider-Waite-Smith, or is the defining factor the relationship between them: the subjugation of the strong by the apparently weak? Crowley and Harris's Lust card, showing the Scarlet Woman upon the Beast, is unmistakably a traditional Strength card, for all its Thelemic ramifications (one of the reasons why the Thoth is such an extraordinarily good deck is that, for all its intellectual and magical freight, it is built upon a solid appreciation of the traditional tarot). Interestingly, Place uses an image, which I assume to be derived from the Eleventh Key of Basil Valentine, that evokes both the Marseille card and the Thoth. So what does the reader actually see when turning over such a card? And what is s/he intended to see? The traditional image, the reinterpretation, or some synthesis of the two? 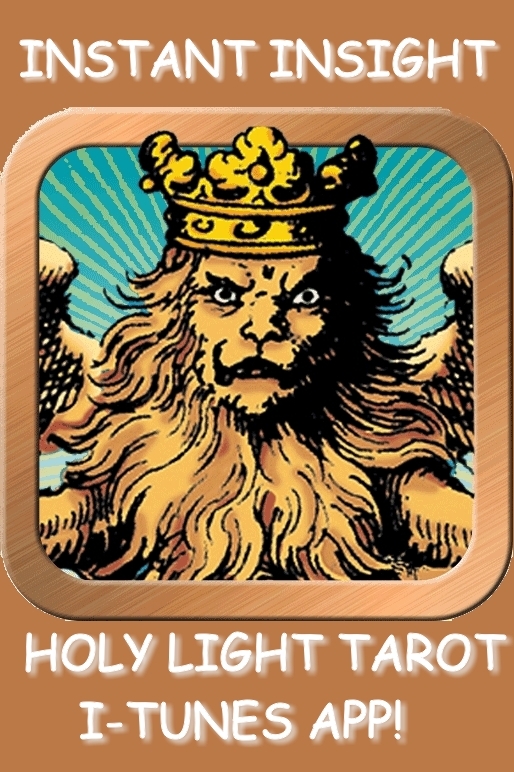 If The Tarot of the Holy Light was designed as an art deck (and it makes a fine one), there would be no issue about its making a shorthand reference to the established form of the card through the transformation of its two dominant figures. If, on the other hand, it is an esoteric tarot, which clearly seems to be the creators' intention, it needs either to transmit the existing message of the card, which cannot be separated from the action portrayed upon it, or to signal that it has deliberately overwritten it. Curiously, Klossowski finds an inherent connection between the figure from Collectanea chymica and the Strength card. In the unmodified form of the design, a chameleon perches upon the lady's right hand: this has been obliterated in Dowers' reinterpretation. Klossowski quotes Fulcanelli's Les Demeures Philosophales: "The Mercury of the Philosophers ... is nicknamed chamaileon--- Chameleon or Crawling Lion [lion rampant], because he successively dons all the colours of the spectrum." With this in mind, perhaps the entire meaning of the card might have been contained in a single punning image. The minors are always problematic, as different people have different expectations of them. I personally tend to dislike fully illustrated minors, as I feel that they diminish the force of the majors: a problem that can be seen in the artwork for the forthcoming Mary-el Tarot, in which the quite magnificent minors leave the trumps looking rather wan and undistinguished. In The Tarot of the Holy Light, the minors are indeed pictorial, but are carefully differentiated from the majors: in general, I find their effect reminiscent of the decorated minors of a minchiate deck, or the symbolic designs of Eudes Picard, although they are far more lavish in detail than either. A few of them are modelled upon the altogether too familiar Rider-Waite-Smith pattern: the most interesting of these is the 4 of Swords, in which the effigy of a knight reclining upon his tomb beneath three suspended swords has been replaced by the crowned double-headed hermaphrodite from Philosophia reformata: the structure of the image is the same, but its implications have shifted. The User's Manual (little white book) which comes with the deck gives meanings of "meditation, retreat, repose, reconsideration" which seem to be a far closer fit to the card Payne- Towler and Dowers have taken for their model than the one they have actually produced, where the central image has unmistakably become one of rebirth. In contrast to the largely unpeopled minors, the court cards necessarily focus upon human figures: a degree of consistency is imposed upon the pages and the knights by each set being drawn from a single source---the four pages are all from Goossen van Vreeswijk's De goude leeuw, and the knights from the title page of the Musaeum hermeticum. As all the reviews of this deck which I have encountered, by Adam McLean himself, Bonnie Cehovet and the notable tarot bloggers LeFanu and Mr. La-Luna, have quite rightly been full of praise for it, I feel that I might permit myself to point out a couple of issues which, who knows, might even be smoothed away in future printings if somebody raised them now. The first point, which more or less everyone who has set eyes upon this deck has picked up on, is the mismatch between the box art, executed by the artist's brother, and the cards themselves. While this doesn't matter when the deck is being sold online, with sample images to refer to, it could prove to be a source of confusion as the deck moves further out into the world, as the box and cards really seem to belong to different decks. While there is no issue about the quality of Patrick Dowers' artwork, I must say that I personally would pass on a deck that sent out those particular signals. My second point, which bothers me far more, relates to the manner in which the cards are titled. This is done in an italic font, which strikes me as being too ornate for the purpose: I wouldn't, however, bother picking up on this if it occurred consistently as it does in the minors, where it is printed in the white lower margin of the cards---after all, tarot forums are full of the boasts of people possessed of nail scissors and strong nerves who took a dislike to the borders of their cards---but the titles and elemental, planetary and zodiacal attributions of the majors are printed directly, left-justified, over the images themselves. I can't believe that it is ever a good idea to superimpose lettering onto a design that is intended for contemplation, especially when the artwork is as dense as it is here, and I think its appearance makes the viewer far more conscious of the photoshopped nature of the images than would be the case otherwise. The different proportion of the images for the majors and minors makes me wonder if the majors were originally intended to be printed without text: whatever, I really hope that any republication of The Tarot of the Holy Light will do away with this intrusive lettering, as it is the one thing that mars a tremendous deck. The Tarot of the Holy Light is available from http://www.tarotuniversity.com/2011/09/tarot-of-the- holy-light-deck.html: the price of the deck, including airmail shipping to Europe, is USD 37.50, payable by PayPal. Paul says that "an all-new one is in the pipeline, but is currently wrapped in secrecy, though it should actually be rather gratifying if it all comes together as proposed." Something to look forward to! I'm persistently bothered by the elemental & seasonal associations which you plot onto the minors, as the two don't seem to work together. I see the sense of Papus' practice in associating each suit with a season, & then mapping that season onto the pips (by zodiac signs in the Tarot of the Bohemians, by months in the Divinatory Tarot). I also see the sense of assigning an element to each suit (though I'm not altogether comfortable with the attributions you use here) & mapping the zodiac signs associated with that element onto the pips. But if you simultaneously do both, it seems to me that you can't help breaking both sets of associations. I don't think that fire, water & air are the appropriate matches for spring, summer & autumn respectively, so the aces & pages of wands, cups & swords seem to present contradictory information to me. Similarly, if you're going to plot the year onto the pips using a system determined by elemental association rather than by season, it seems inconsistent to also associate each suit with a season. OK, that's the bone I chew at. Quite possibly it reveals the same kind of urge to see everything bent into a neat sycretic system on my part that I distrust in the Golden Dawn & suchlike. But I would actually be really interested to know how it's meant to work, as I feel that I've failed to get it." Here we have the whole deck charted into the Zodiac, and the entire logic of the astrological mesh explained. So let's discuss these things in this context. Clearly, I am not limiting the suits to the seasons. I don't like that model because it isn't flexible enough to interweave with the astrological wheel in a natural manner. One ends up with the Fixed and Mutable signs attributed to the wrong suit, even though the Cardinal signs are aligned with their correct Solstice or Equinox. I'm much more sympathetic with each suit containing the whole element, Cardinal, Fixed and Mutable. This is because I'm both an astrologer and a Tarot reader, and I want the Tarot to speak directly to people's charts. This icon was created as a way of charting one's Tarot spread over the top of one's astrological birth chart. That way one can instantly see how the cards are talking to the client in respect of both their innate esoteric structure, and in respect of the current transits in the heavens. I find that with this body of correspondences, the cards become incredibly transparent to the astrological situation 'overhead', which is constantly and steadily changing. As to the assignment of the suits to the Elements, you can read my chapter on the Elements and the esoteric content of the Pips here: http://www.tarotarkletters.com/2005/11/esoteric_pointe.html . As you can see, I am responding to the thinking of the Renaissance philosophers who were theorizing about these things while translating the newly-acquired writings of the so-called Prisca Theologia. I'm aware that other people attribute the suits differently, but again, being an astrologer (and somebody who has been trying to dig down to the oldest astrological approaches as well), I want to be able to use astrological rules with the Tarot. Since Tarot didn't have a manual (that we know of), I'm trying to pull forward the assumptions a working multi-modal Renaissance esotericist might make when looking at the cards. In Western astrology, Spring starts with a Fire sign, Summer with a Water sign, Fall with an Air sign and Winter with an Earth sign. Since I'm going to be working this pack through a combination of astrological, kabbalistic and alchemical praxis, I need all the individual parts to line up with each other just the way things work in Nature, or the whole arrangement falls apart once it's set into motion. And if you think the Kings are missing a support that the other two Royals receive, remember that they stand at the cross-quarters of the ancient Wheel of the Year, so they stand for and are fed by the holidays that mark the half-way points and "peak" of the seasons -- Imbolc, Beltane, Lughnasadh and Samhain. These guys hold up the "four corners of the world" with their fixity. Because of the eventual Kabbalistic usage that's also built into this paradigm, it is necessary to be aware of the "grain" of the Zodiac, which is always only going in one direction, towards the future. Even with the appearance of reversal happening sometimes, (the illusion of retrograde motion), there is really only one way the whole model "flows", mirroring the planets moving inexorably in the sky. In the Kabbalah they talk about energy "running and returning" up and down the Tree, based on the fact that the mother-letter Shin pumps light (primal fire) down the Mother Pillar, which then is answered by the mother-letter Mem sending compassion and love (primal water) up the Father Pillar. This whole thing revolves around the mother-letter Aleph, which is the crossbar of the Heart triangle. Following this line of thought, one can stand at any point of this Zodiac Star pattern and see how the energy of Nature "runs" towards the future signs and then "returns" via the past sign. If you are standing at the first degree of Aries, and you look out towards the other Fire signs, the energy will be "running" towards Leo and "returning" from Sagittarius. The 2 of wands has an innate link with the 5 of wands, and the 3 of wands links up with the 7. All the cards within each suit "run and return" into each other in this way. These links are expressed through the sub-rulers of the decans, as given on the faces of the cards. (And if you haven't noticed yet or been reading the Arkletters, I typo'd the 7 and 8 of Wands, you need to switch the rulership of Mars and the Sun on these two cards). the Ace of Wands upright is Mars in Aries, and reversed it's Mars in Scorpio. THIS is the part of the deck that relates directly to Alchemy! It is through use of the Stoicheon-Somata theory on the Tree with truly functional astrological correspondences that one can understand the Alchemical remedies that the cards propose. I'm sure this sounds sketchy at best to someone who hasn't been steeping in these cross-correspondences for years like I have. But from the earliest times of studying Tarot, I have been looking for the method of combining these different disciplines in such a way that the whole astrological, numerological, kabbalistic and alchemical matrix could be experienced seamlessly, as a whole, without huge breaks and rips in the system because the Kabbalistic considerations run crosswise against the astrology, yada yada. The THL is the final outcome of my search. This is also the reason I insist that the Fool is last in the Trumps, and in the Alphabet. That specific placement is essential for plotting the Tree out correctly, following the 12/7/3 path-pattern that the Sefir Yetzira insists upon. In the spirit of playing devil's advocate I will just say that I remain a little concerned that I, at least, cannot treat the deck as more or less anyone can a Thoth, for instance: that is to find it open to interpretation on a varying gradient of complexity, ranging from treating it as a generic tarot, through the stage of being able to lay the cards out and seeing the relations between them in a purely mechanical sense, even if the specific thinking behind those relations is not understood, to using it with the Book of Thoth in hand (or head, indeed). I do feel that the Holy Light works beautifully on the lower level and the upper level indicated here, I'm less sure about the ground in between. But I appreciate that this is a byproduct of the deck's complexity and the seriousness of your intent, and that I may have skewed my own reaction to the cards by approaching them looking for the wrong thing. Your view of the "Oreo sandwich of Tarot" is interesting to me. I'm hoping that people will take a risk with that "soft center" once they have assured themselves that THL is actually a good working deck for daily use. People don't really have to buy into all the Sophianic esoteric Christianity unless they really feel called to it. In fact, there's no doubt that there will likely emerge a subgroup of people who aggressively hate the book and read the cards however they darned well please. That's got to be OK too! To be fair, it wasn't until I got to the bottom of that Stoicheon-Somata model that I came to understand how to stack the blocks of the various esoteric disciplines in a way that allows them all to integrate together cleanly. You have to put everything back in to historical order, and add the layers in the order that they originally emerged. I would never have gotten up my courage to do this thing if the necessary information hadn't been flowing out of the Astrology historians, and if one of those people wasn't a personal friend. Blessed coincidence! Plus, I had to work through all the various versions of the Sephir Yetzira to really understand how to discriminate the value of one compared to the other. Even though I first made my Astro-Alpha-Numeric chart in the late 1980's, I still didn't fully understand the nuances that differentiate the various iterations within the Continental stream until I fell into Boehme's pot of gold. Boehme confirmed the canon. Ultimately the THL is the product of many, many year of midnight-oil burning, just to get the exposures that would awaken me to this particular integration of disciplines. It's been a whole lifetime of falling through false floors and making trick bookcases spring their latches -- big fun for me! For the record, I was really impressed by the clarity & conciseness of your response. I still need to work through it carefully with the cards spread out in front of me, but it left me in no doubt of how thoroughly you've processed a complex and often deliberately cloaked mass of material. I think it is tremendously important that people can just run with the deck. Speaking as someone who's spent altogether too much time working with material that's of merely recondite interest, one of the things that I value in the historical tarot is the manner in which it is simultaneously robust & arcane. Another thought came to me that might help you contextualize what I'm doing. You might have noticed the amount of art from Jacob Boehme and his students, interwoven into the pack. I made a deliberate esoteric decision, after Michael kept making these aesthetic choices over and over, to look into the worldview of the Protestant Theosophers. Arthur Versluis and his fellow professors of Western Esotericism have repeatedly reinforced the point that Boehme was one of the role models of the Rosicrucian dream and the Masonic reality. Placing myself in Boehme's shoes, and going over the materials that he was having his students learn, while also trying out his "thought-forms" within my own Tree, eventually convinced me that Boehme's worldview was perfectly transferrable to the Tarot. We know for certain that Boehme's work impinged upon Etteilla, Levi and Papus, because Boehme set much of the occult vocabulary for the centuries that followed, especially that of Swedenborg, Martinez and Saint-Martin. The latter two master teachers brought this philosophy and praxis forward (with their own additions, after all) via the Elus Cohens and Martinist Orders, which were then revived and combined by Papus at the edge of the 20th century. All of our 'Tarot silverbacks' of the 19th century have a connection to and through the Martinist channel; I have written extensively about this over at the TarotArkLetters site. Over the last few years I have fallen into a veritable ocean of data on all of this, so I'm utterly fearless in taking these stances. I'm pretty clear on what I've got here! Folks who follow up the resources I'm citing are going to have their minds blown regarding the depth of research that is available nowadays on this "underground stream", the very same stream I've been raving about all those years since my first book. People might look askance at my application of Boehme's worldview to the Tarot, but they won't be able to wave away the historical facts of magical thought and practice so easily. In the THL, I'm grounding myself in the astrological, kabbalistic and alchemical thinking of the early 17th century, working within Boehme's magical and Gnostic Lutheranism, (which was itself based in Paracelsus' medicine and his Valentinian-flavored gnosis). Boehme was an esoteric genius, an exquisitely gifted visionary, and he was absolutely central to the preservation of Christian esotericism through the Reformation and counter-Reformation! He was also teaching and laboring towards the birth of a "third world age", this one leaving behind the dichotomy of the Old versus New Testaments, to enthrone and worship the Holy Spirit, envisioned as the Divine Sophia. I link the Trumps of the THL to their Sophianic Christian (Gnostic) cognates, using Boehme's directly-stated esoteric values as found in his writings and artworks. Boehme offers a perfect place to locate ourselves in historical perspective, since his work is well-explicated and his esoteric baselines are clear. Ultimately, I'm using the story of the Qabalistic-Alchemcial Angelic Yoga of Boehme and his followers to give a magical accounting of the traditional Tarot. This Theosophy is projected upon the Marseille-style Tarot pattern, following the Continental rule that A=1. The whole synthesis and armature of Boehme's astro-alpha-numeric-qabalist-alchemical yoga, explicated via the THL, has in other contexts been called the Religion of The World. It's a gnostic, feminist, evolutionary Christianity that supports each striving soul to be come androgynous ('angelic') and transcend our temporal identities. It's shamanic in that it teaches us how to use the kabbalistic structure of the astral body to outgrow the time/space ego -- and do this well before one confronts the body's death. Boehme and his fellows knew about the teaching of reincarnation, and they also knew how to evade the Christian proscriptions against such teachings. It is amazing and wonderful to see what these people have done on the contested ground between Catholicism and Protestantism, while never losing sight of the value of Christianity's siblings Judaism, Islam and Gnosticism! All of this angelic Theosophy rides like foam upon the wave; the wave itself being made up of the occult and metaphysical 'bone structure' illustrated by the Tarot traditions, and specifically (for the 21st century) in the THL. If Michael and I have done our jobs right, the resulting ferment will promote a gentle but powerful magical suggestion for the user to attune their body to the living Cosmos. That's what the cards are speaking to, every day as they are used. This gives you a slightly deeper view on our pack. In terms of magical correspondences, it stands in the time-gap between the earliest Marseille-style Tarots and the Etteilla pack, representing the lineage that preserved the traditional assumptions of Renaissance Magic up to the edge of the 19th century. By putting Boehme on our bull's-eye, we "fix" the astro-alpha-numeric canon as it was being used across Europe in his lifetime. With this baseline proposed (and in my opinion established) via the Tarot of the Holy Light, historians can hopefully begin to feel our way forward with more confidence, better able to appreciate the material that the spiritual magi of the Rosicrucians and Masons who preceded Etteilla were studying.